Are you sick and tired of repairing your old AC? Do you find that your AC no longer lives up to your cooling expectations? If you’re in the market for a new air conditioning system in Columbus, OH, then you have a staggering array of system options available for installation, depending on the layout of your home as well as your budget. But the most important aspect of this process of installation or replacement is hiring a quality technician to perform the job. Only a pro knows how to perform a load calculation of your home so that you get a system that matches the volume of air in your living space exactly. In this post, we’d like to share with you a list of just a few of the types of ACs that we offer. Call Quality Air Heating and Air Conditioning for comprehensive Columbus, OH air conditioning services, including installation. Central air: By far the most popular type of cooling system throughout the country, central air comprised two units: an indoor air handler/evaporator and an outdoor compressor/condenser. Like all air conditioning systems, a refrigerant circulates throughout the system, cooling your indoor air and dissipating this thermal energy outside of your home. This system requires extensive ductwork to extract warm air from your home and send cool air throughout your home. Ductless mini split: As its name suggests, a ductless mini split does not used ducts to distribute cool air, although it works just like a central air in other respects. The main distinction is the design of the indoor air handler/evaporator, whose sleek and compact profile is installed directly in the living space, either high on the wall or suspended from the ceiling. There is no duct intermediary. It connects to the outdoor unit by means of a group of electrical, refrigerant, and drainage lines. Geothermal: This comprehensive, year-round solution uses the moderate temperature of the ground to keep your home cool during the summer. An “earth loop” of piping is installed in a horizontal bed, or in deep vertical wells, and these connect to a heat pump. The cool temperature of the ground moderates the air drawn from your home, and cools it using the thermal energy of the earth. 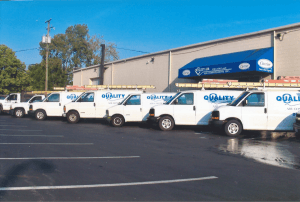 For comprehensive Columbus air conditioning installation, call Quality Air Heating and Air Conditioning today!